We don't often write about food on KNSTRCT, but this is not a subject about food. This is about innovation. Last Friday New York based Chef Dominique Ansel debuted a tasty new invention: the CRONUT, a delightful croissant x doughnut hybrid. No need to go any further, really, that should be enough to make you hop down to the Soho bakery and pick up a dozen. Oh, but that might be hard for New Yorkers, as the bakery has been selling out by 9:30am each morning since opening day. Each of the gooey CRONUTS consists of a specialty croissant dough that has been proofed, then fried. To flavor, the CRONUTS are first tossed in sugar, and then filled with Tahitian vanilla ganache, and finally finished with a rose glaze and crystallized rose petals. Needless to say, once word hit the streets about Ansel's CRONUTS, tenacious Manhattanites poured into the bakery to be the first to get a taste. Unknowing of the hybrid's success, Ansel only debuted 50 CRONUTS on Friday morning. With lines of people streaming out the doors of the shop, all sold out within 20 minutes. The CRONUT mayhem has since been in a critical state. Ansel rose to fame in New York City, where he served as the Executive Pastry Chef for Restaurant Daniel under celebrity chef Daniel Boulud. Before New York City became his home, and Boulud became his mentor, Ansel picked up the art of pasty making in his hometown of Paris from his father. Since then, Ansel has been named one of the “Top 10 Pastry Chefs in the United States” by Dessert Professional Magazine in 2009. 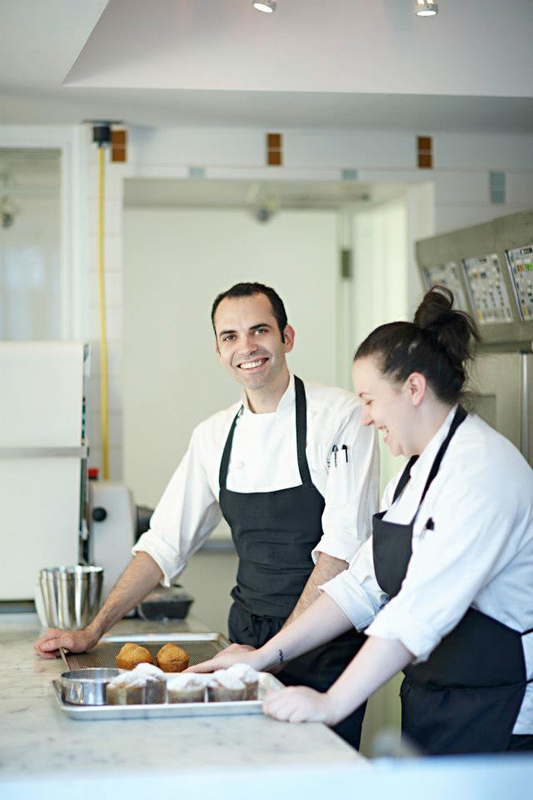 In 2010, Dominique was chosen by Time Out New York as one of the city’s “Top Ten Pastry Chefs You Need to Know”. No need to fret New Yorkers, we hear that Ansel and his team are now working all night to bake you extra loads of CRONUTS.